Wouldn’t you pay more for a home with a lush lawn, flowering trees, a deck and patio? You’re not alone. 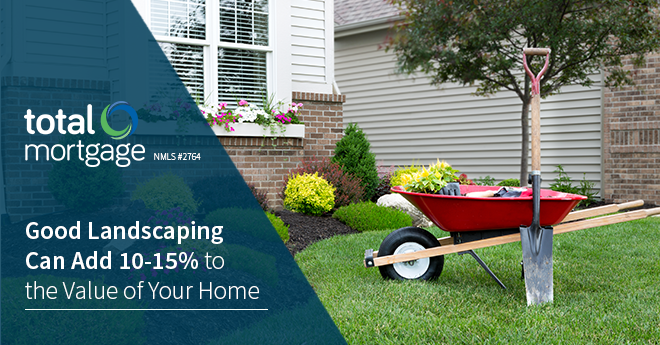 Studies show that landscaping can add 12 to 15 percent to the value of your home. All you need is a green thumb to put some extra green in your pocket. Landscaping is more than flowers and shrubs. Upgrades can involve things like patios and decks, flowerbeds, barbecue pits, watering systems and plants of all sorts. As you enter into a landscaping project, you have plenty of choices about what kinds of upgrades to make. The trick is to make improvements that prospective buyers want. If you do, then your property value will rise. Though experts agree that landscaping improvements usually raise a property’s value, it can be extremely difficult to predict exactly what kind of gains a specific homeowner will see in her individual circumstances. Estimates vary by home and notes that the lasting effect of landscaping requires ongoing maintenance. Virginia Tech horticulturist Alex Niemiera concluded that landscaping can add 12.7 percent to the value of a home — in his research six years ago. That translates into an extra $16,500 to $38,100 in value on a $300,000 home. In extreme cases, property values can more than double, and conversely, they can actually decrease if the landscaping contains undesired features that the local market doesn’t support. Of course, it’s quite easy to spend more on installation and ongoing maintenance than the landscaping benefits the value of your home. A professional landscaper might seem like an extravagance, but they can help you gain equity in your home and save money by recommending features and plantings that will appeal to buyers and are cheap to maintain. For example, perennials and bulbs can add color and style to your property all year long. Other cost-effective improvements include aesthetically pleasing architectural improvements, such as stone walkways and terracing that require little or no maintenance. Another important factor to consider is the contractors who do your landscaping upgrades. Many companies vie for this kind of business, and choosing the right contractor can make a lot of difference. Find a contractor with whom you are comfortable, who is honest and patient, and who can show you a good track record. Lastly, pay attention to the details. A subtle, small change, such as curving the edges of your flowerbeds, can by itself increase your home value by 1 percent. Vila cautions homeowners to remember that everything doesn’t have to happen at once. Consider a five-year plan that has plantings maturing at varying rates and adds various features each year. This way you can remain within your budget—time-wise and cost-wise—while still progressing toward a complete landscape renovation.